I never realised I wanted to be a writer until I saw a movie called ‘Salem’s Lot when I was just eight years old and it got me hooked on the horror genre and the writing of Stephen King. I used to read a lot as a kid and Stephen’s books were an inspiration, but along with that I was also reading Alfred Hitchcock and the Three Investigator books which were a lot of fun to read. It was early one evening when I was around Ten years old that a switch got turned on and all these stories started going through my mind so I put pen to paper and began writing about these four characters that would eventually become the Awesome four. I would just lose myself for hours in my own little fantasy world just letting my imagination run wild. Sometimes I could start writing at six ‘O clock in the evening and get so lost in the stories that the hours seemed like minutes and when I’d finally stop and look at the clock on the kitchen wall it would be One ‘O clock in the morning. So that’s how it all began for me. It depends on how I feel. The thing about writing is some days you absolutely love it and the words just flow easily onto the page and there are times when you just absolutely hate it, when the words just don’t come too easily and the dreaded writers block kicks in, but having said that the first book of the Awesome four series took me just over Eight weeks to write where I was writing everyday and loving every minute of it, but then the second book took me almost a year due to health issues and now the third and final book is coming together nicely now just doing a few minutes every day. Then you have the Darkness of the Soul trilogy my series of dark poetry, those books were written in three days flat, one book a day which amazed even me. I woke up one morning and had these strange poems going through my mind and so I wrote them down I liked what I’d written and so I published them. So the writing process is like a roller coaster ride, one minute your word count is up the next it’s down so it’s very difficult to say how long it could take to complete a book it’s just an unpredictable process. When I’m in full on writing mode, things can get a bit hectic. I can be a bit of a grouch when it comes to getting a story written. When I’m writing and the words a flowing the last thing I need is to be interrupted unless it’s a genuine emergency because once the flow is lost it can very difficult to get back into that mind frame. Before I begin writing I always make sure to have as many of my chores completed before hand just to free up the time. I’m what’s know as a seat of the pants writer, which means that I don’t plan or outline any of my stories I just start writing and let my imagination go where it wants to go and that’s the way I have always wrote, and it’s also an adventure for me because I don’t even know where my imagination will lead so I’m just along for the ride. What brought you to write this book series? I originally planned to write just one book and that was it but when the first one was completed I had enough stories to do a second and now here I am going onto my third and I promised myself that this is the final of the Awesome Four adventures and I’m going to send them out in a blaze of glory. As I already said, when I re-discovered those stories and read them, they all just seemed to go together fairly well so when I got my first ever computer, I typed them up had them edited by Ms. Eliza Knight who is a very successful author herself, and she said that I was onto something good here and that helped bolster my confidence, when you get positive feedback from someone who has already made the break it really does help. So that’s why I wrote a second book of adventures. All the stories in the Awesome Four books are inspired by people I encountered and places that gave me the creeps over the years. I’ll give you two examples: First there is a farm house not too far away from where I grew up and the place used to give me the chills. At night when the lights were on it reminded me of the house from the Amityville Horror and there was always an eerie mist around the place to make it even spookier. I always remember looking at it one night as my Dad drove by and wondered What if this house had a sinister past? What if there was something evil lurking inside? I went home and wrote a story called the terror at devil’s mansion completely inspired by that old farm house. The second example is another story, well three stories with the same villainous character named Harry Gordon the chainsaw madman. Years ago when my friends and I used to hangout, we used to do so in a forest just down the road from where we lived. Well there were Lumberjack’s there cutting down trees making way for a new picnic area and a roadway etc. One day, my friends and I were walking along and laughing when this huge man comes lumbering towards us, I mean he was over six feet tall and built like Arnold Schwarzenegger carrying a chainsaw over his shoulder, he had a big white scar on his left cheek, he was quite menacing as we walked by each other he looked at us from the corner of his eye and kept moving. I watched him walking into the distance and my imagination fired up. What if this guy went crazy and started killing people with the chainsaw? Now it might sound like the Chainsaw Massacre but it’s nothing like it. As soon as I arrived home I began writing and came with the character of Harry Gordon. That’s the thing about writing, inspiration can come to you at any time in any place and thanks to Evernote I never have to worry about forgetting an idea. I began writing at the age of ten and by the time I was Seventeen I had amassed an incredible amount of stories almost seven hundred to be exact. They were all written long hand and of course as the years went by pages went missing or the stories were misplaced altogether. I lost interest in writing altogether at this point as my social life became quite hectic, hanging with friends, girl friends to meet up with etc. So the stories went into the attic and lay there gathering dust for years until I found them again and began reading over them. It actually put a smile on my face because some of them were just plain terrible, but the ones that I liked I kept and just re-wrote them. You see they were written by a teenager for teenagers so I wanted that to reflect in my writing, simple stories with straight forward language nothing fancy but it worked. 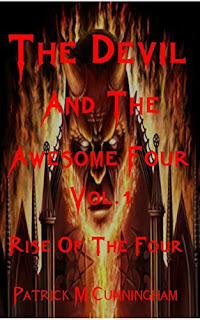 So after re-writing the stories, I decided to get them published but first I needed a title for the book, and the Devil and the Awesome four was one that came to mind straight away so I ran with the idea, and the stories that I had to re-write became parts one and two. 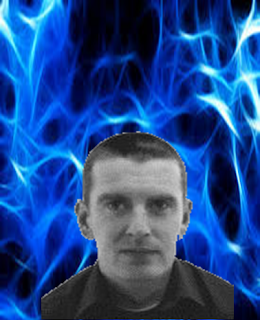 I think I was Thirty years old when I re-wrote the tales and around Thirty five when I published them. And here I am at Forty two finishing what I started all those years ago so it goes to show it’s never too late to start or finish something you feel passionate about. I love reading and do so nearly every day, I read books on just about anything from marketing, to writing and self defense. I have practiced martial arts for years, 29 to be exact and I still keep up my training whenever I can though being part of a club does not appeal to me anymore, I continue to train at home and practice the skills I have learned just to keep active. I love watching documentaries especially crime and investigation or the history channel as I find both those TV channels quite inspiring when it comes to getting ideas for my writing. I have written seven books including dark poetry, but the Awesome four series are definitely my favourites because they’re fiction and it gives my imagination time to run wild coming up with stories and scenarios for these four characters that I created all those years ago. I am currently working the last book in the Awesome Four series and I am hoping to have it finished and ready to publish in late October. A Halloween launch would be very cool if I can manage it but in the world of writing plans can go awry but a definite book due in October editing and re-writes permitting. After this series is completed I plan to write a full length novel which will be a change from the short story structure I have used for the Awesome four series. I have already started the new book and pretty much have it outlined it’s kind of like my version of JAWS, one of my all time favourite movies so I thought what the Hell why not write about your own killer from the deep and I really look forward to writing it.